Light the birthday candles and congratulations all round at Stannah Microlifts. The company is marking its 40th birthday, 20,000th Microlift and 1,000,000s of dumb waiter journeys, improving customer service and manual handling everywhere. As with most birthdays there will be a party but this time there will be no presents. In fact, in direct opposition to tradition, the birthday boys and girls will be gifting their 20,000th Microlift to a worthy cause. The search is on for a suitable project that will fall in line with Stannah sponsorship guidelines to ensure any donation or sponsorship supports as many people as possible in a community scheme. It might be a children’s hospice, youth project, activity centre, village hall, care home…the possibilities are endless. Naturally the company is contacting building professionals who have had contact with Stannah before, as well as widening their search in the trade press, to invite the experts to nominate a project they think would benefit from this free Microlift and would be a befitting home for the 20,000th installation. So where do Microlift service lifts generally make life easier? 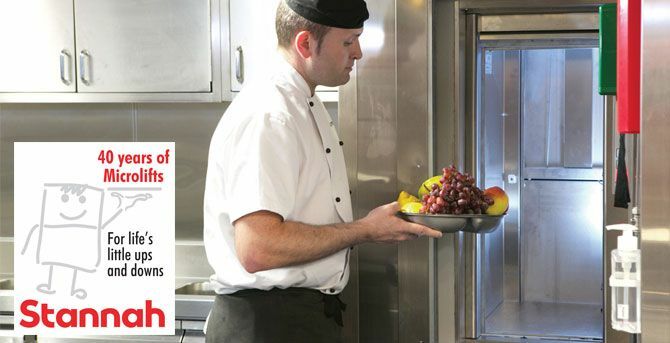 Well the bulk are food lifts in restaurants, pubs, hotels and bars moving food and drink all day, every day to help busy staff avoid the stairs with awkward loads and deliver excellent service. There are more unusual uses for dumbwaiters such as moving money in casinos, delivering dentures in dentists, bringing books in the library, whizzing widgets in the factory, shifting shoes in retail, lifting loaves at the bakery, protecting pots at the pottery and transferring toddies at a distillery. Then there’s feeding the five thousand at race courses, football stadia, schools, universities, airports, railway stations – the list goes on. Where was the first Microlift installed? Records show this may well have been Luigi’s Italian Ristorante in Tavistock Street, London in the early 70s – a duplex pair were installed and renewed twenty years later! Close behind was a lift installed in Mayfield School , St Leonards which, 39 years later, is still used every day and serviced by the London and South East Branch of Stannah in Crayford. Celebrity lifts? There’s been a few. Not too many we can mention! Microlifts are very popular additions to grand homes; some royal, some show-biz, some theatrical, some in well-known places. There’s the Royal Mint, the Royal Observatory, the Stock Exchange, the Shard, the set of East Enders (Argee Bargee), the Old Vic, Lambeth Palace, Sunninghill Park, Lords Cricket Ground, Twickenham Ruby Ground and many more. All at sea? Yes, Microlifts certainly are! These indispensable mini-butlers are busy crossing the oceans on , Offshore Patrol Vessels (Trinidad, Tobago, LÉ Samuel Beckett – Irish Navy), Tattershall Castle (moored on Thames), Waverley Steam Ship, HMS Warrior, Sail Training Ships – Tenacious and Lord Nelson. It’s amazing how useful the Stannah Microlift is in so many different parts of our lives and absolutely vital to some people’s day to day jobs too. For the chef or the retailer, the coffee bar staff or the librarian, their Microlift is essential to the success of their business. And that’s where Stannah lift servicing provides crucial support. From a UK branch network of eleven service branches, and with more than 360 lift engineers, Stannah provide 365 day maintenance to ensure their Microlifts never let them down. Naturally over 40 years and 20,000 Microlifts there are hundreds out there and Stannah don’t know where all of them are. Over the next few months they’ll be inviting the people who own or use their dumbwaiters to add them to our ‘map of Microlifts’. Contributors can post a ‘selfie’ with their lift too! It’s a Microlift Quest!